May I say how much Marcia and I enjoyed reading your various comments last week. 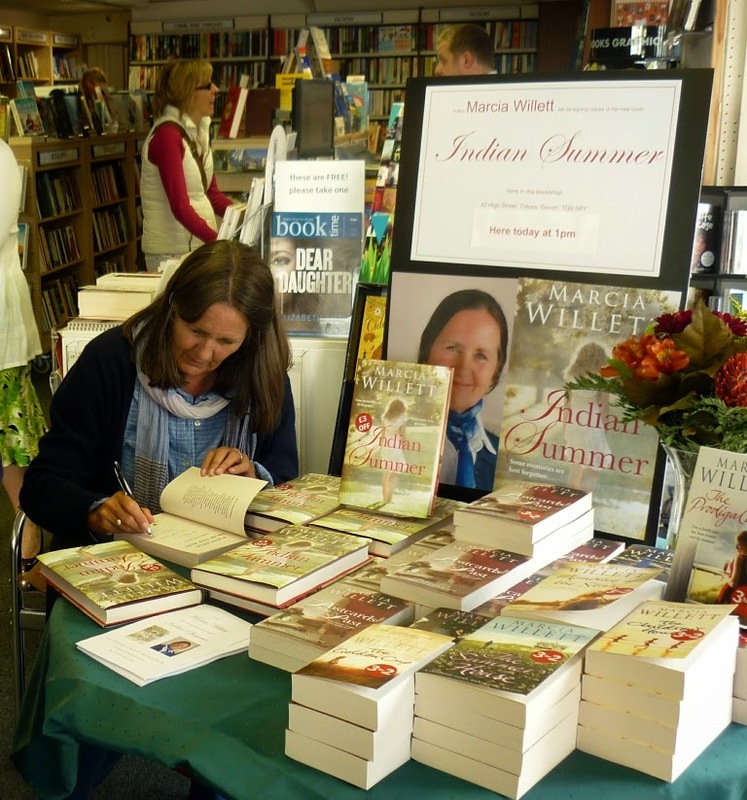 She is, of course, thrilled to feel that she has created characters that readers feel are real (and, being Marcia, never fails to be amazed when people say so). Anyway, just for fun: any thoughts on the way that Honor Trevannion coped with the various predicaments that life strew in her path? 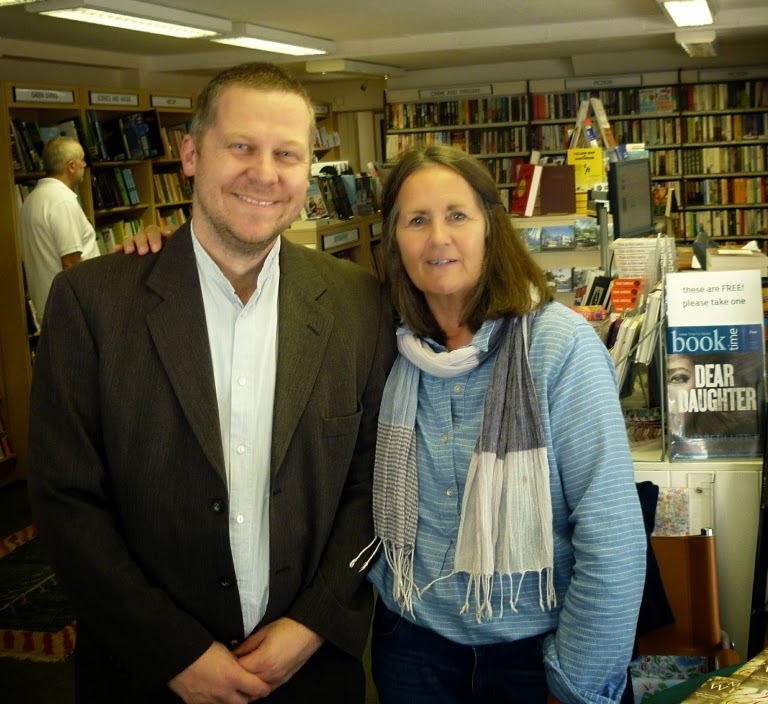 Marcia signing books in the Totnes Bookshop and, below, with Cliff Shephard the shop's manager. The moth I showed you last week is known as Angel Shades (Phlogophora meticulosa): my thanks both to Joy in Delaware and, on this side of the Atlantic to John Lockwood in Warwickshire for identifying it for me. The adult is no problem but the larva are generally considered to be a garden pest as they feed on a wide variety of foliage and flower buds. So there you have it – do you value your plants more or the occasional and rather delightful moments when you see the adult in all its glory? The Royal Horticultural Society suggests either torchlight sorties during which you remove the larva by hand (and then what?) or using a chemical pesticide. Personally I am rather against using pesticides: in part because it seems simply wrong and in part because you don't know who is harmed by them (including, of course, people). 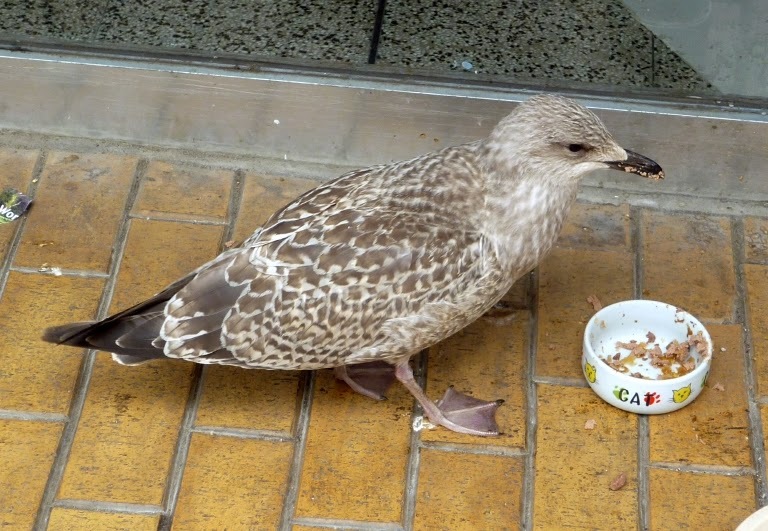 While Marcia was signing books, this immature herring gull was enjoying a spot of lunch just up the road. Was he stealing some cat's lunch or had someone put this out for him in a cat bowl? Which leads me on to think about the role of insects generally in our lives – a role that I fear is somewhat overlooked. There has been a collapse in the bee population here in the UK. This matters as bees (and other insects) are vital for the pollination of many of our crops. It seems that the decline started in the 1990's with the introduction of neonicotinoids – a group of pesticides. Although there is no actual proof that these are directly responsible for the population crash, the timing must make it real possibility. It is, of course, always tricky to be sure as to what causes what since that was about the time when in the UK we started to introduce a more intensive form of agriculture which included monoculture which destroyed many habitats that were bee (and other insect) friendly. Back in the spring of 2013 the European Union banned the use of certain insecticides – but was that a wise decision? Ignoring any feelings we may have for the insects themselves, it is, I suppose a matter of balance. On the one side is the loss of potential food as a result of damage caused by insects – on the other is the loss of pollinators such as bees resulting in lower crop yields. I am glad that the EU imposed this ban and rather ashamed that the UK voted against it but I think that says more about me than anything else. Causation: a very interesting subject and one that crops up when Marcia and I are talking about whatever it is we are writing about (be that her novels or some of the hacky stuff I am working on). It rather matters and I suspect that not taking causation seriously enough is the cause of much that is written that doesn't quite work. The other day we visited the Two Bridges on Dartmoor because Marcia had a feeling that her new group of people might meet there. It was a fruitless trip as it happens - she drew a blank. Meanwhile the hotel's little flock of geese appeared and one of them plonked itself down in a way I have never seen before - so I took his (or, of course, hers as the case may be) portrait. Why, to take a recent example, did Tristan behave the way he did? Well, by the time we get to the end of Postcards we know the answer to that question. The important thing is that Marcia knew from the outset what made him what he was and so he was, throughout, a fully rounded character. Thus it is that she (or we) delve back into the history of all the people that appear on the page (and quite a few who don't but who would have been an influence on those who do). This applies not only to the people but to the landscapes as well. I have often mentioned that Marcia will 'see' a given location which will include certain objects – a certain sort of house, plants, a view, a river and so on – and then we have to try to find out why such objects exist where they are placed. In the end (and this is another of those mysteries) it will come together and everything ends up making sense. Getting there, however, can be fraught. It's a bit like that when I'm writing what I think is best described as 'cod history': chatty and informative but with no pretensions to be taken as serious history. The intention to give a feel of a certain place over a given period of time. First of all, of course, it has to be honest (which means accurate) but after that it all depends on why the history is being written. This is in my mind, of course, because I have just finished the Dartmouth book and am starting on Marcia Willett's Tavistock. Although I have often written and talked about the history of Dartmouth (and a few other parts of Devon including Dartmoor) as it happens Tavistock has not been one of them so I am starting from square one. 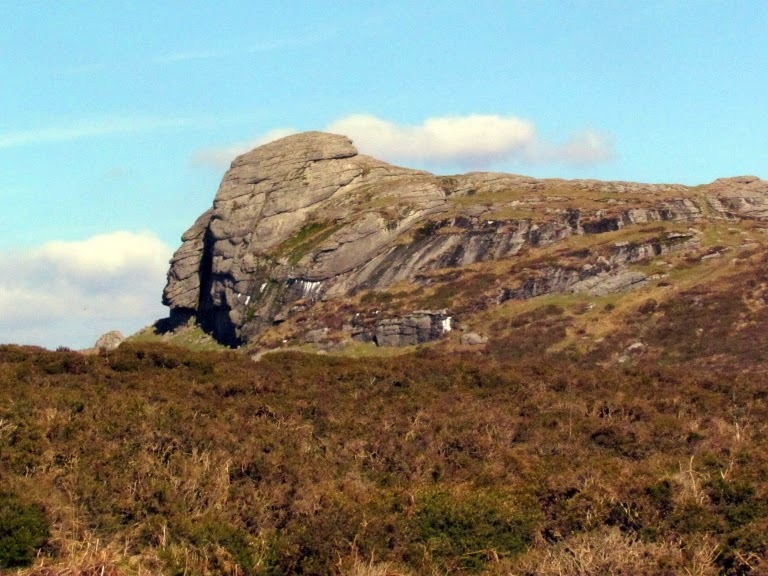 Since I expect that most of you are now into Indian Summer, I thought you might like this picture of Haytor. Going as far into the past as I can I discover that there is a suggestion (I have yet to find definitive proof of this) that there was an earthwork about mile to the north east of the centre of the town which would seem to be about four thousand years old. At the end of the day this earthwork may or may not be mentioned in the book. If it is, it may be no more than a sentence and certainly no more than a couple of paragraphs. Meanwhile, this small hill which seems to have been built by human hands will occupy my thoughts for some time as I trawl through all sorts of information in books and on the internet in an attempt to answer three questions which are dominating my thoughts at the moment: who built it, what was it and why was it built? All of which is, of course, summed up in one word: causation. As I write this, Marcia is doing something similar as she probes into the past, the present and, indeed, the future of some of the people occupying her mind. One thing is for sure: unlike my people, none of them will bear the labels of Briton, Celt, Saxon or Norman. This extraordinarily charming chap answers to the name of Leo. 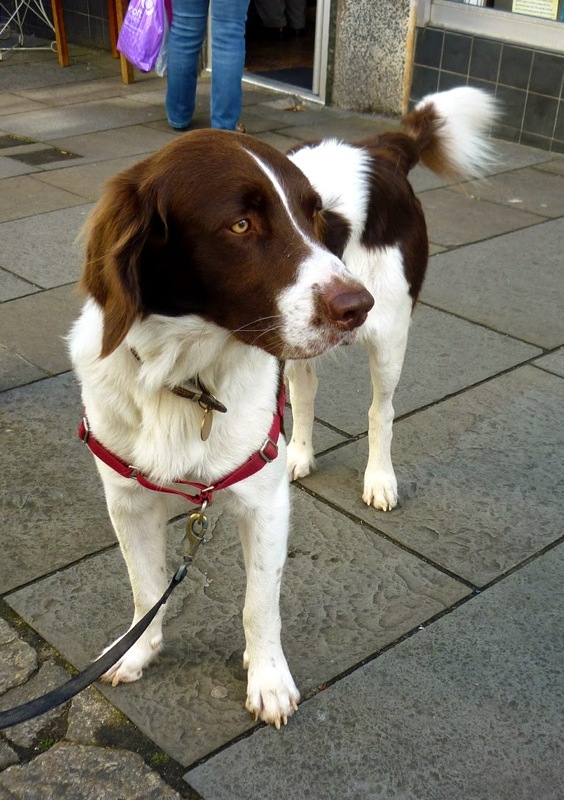 He is a Dutch Partridge Dog – a breed unknown to me. 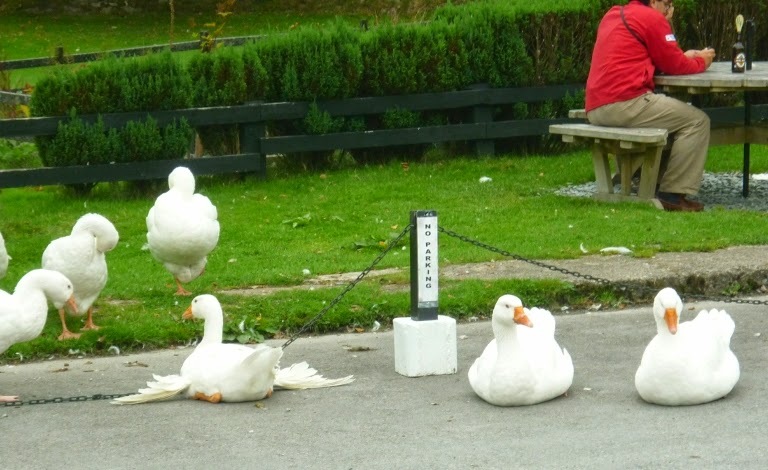 It seems that they are far more popular in the US than they are here in the UK. Having read up what I can about the breed I am sorely tempted – but I shall have to fight the temptation as we really have decided that there will be no more dogs. Honestly. Probably.